Set in ancient Egypt in a time of chaos and revolts, Saqqara is a game with lots of bluffing, speculation and development for 2-5 players. 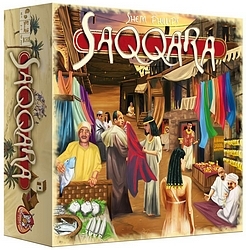 The players assume the role of nomarch in ancient Egypt and attempt to influence the country's government and economy. They sent merchants to the market to collect goods to develop their province, recruit workers to build pyramids, and claim fertile land on the banks of the Nile. The player who succeeds in developing his province best by cunningly making use of the privileges of the pyramids and claiming a large area on the banks of the Nile wins the game and becomes Egypt's new leader. Watch out for beggars, thiefs and sneaky bluffing nomarchs from other provinces. They want the same as you: power over Egypt.